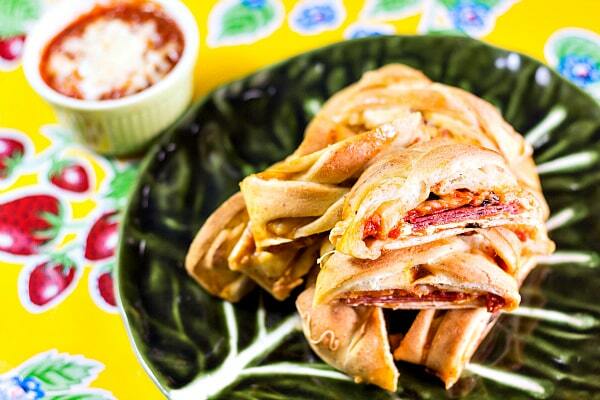 Put a fun twist on pizza bread with this easy to make, easy to eat recipe! I make my own pasta sauces, but it’s also really nice to be able to swing by the store and pick up a jar or two of marinara to use either “straight up” on really busy nights, but also to use as a base for all sorts of variations when you have just a bit more time. I think you’ll like the shortcut sauce, and you’ll find yourself using this little trick pretty often–whenever you need to make a sauce thicker for use as a dip, for example. Dampen a coffee filter with some fresh water, place it into a glass or wide-mouth jar and then fold the edges of the filter back down over the rim of the glass or jar all the way around, making sort of a cuff. Carefully pour your sauce in and let it drain for a few minutes to reduce the water content and concentrate the flavors. Easy! I was left with a thicker sauce that I knew would keep my finished bread from getting soggy. I use large square coffee filters. If you use the basket kind, just smooth one out into a fine mesh strainer and set the strainer over a bowl. That’s easy, too! Without further ado, let me show you how this pizza bread comes together. See, I made a video for you! It looks really great, doesn’t it? And do you see how rich and vibrant the sauce? It’s amazing what a coffee filter and just a little time can do! 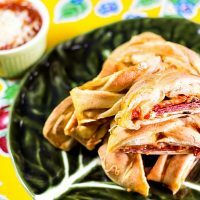 The pizza bread is a spin on my Pepperoni Bread in case you’d like to try both variations. 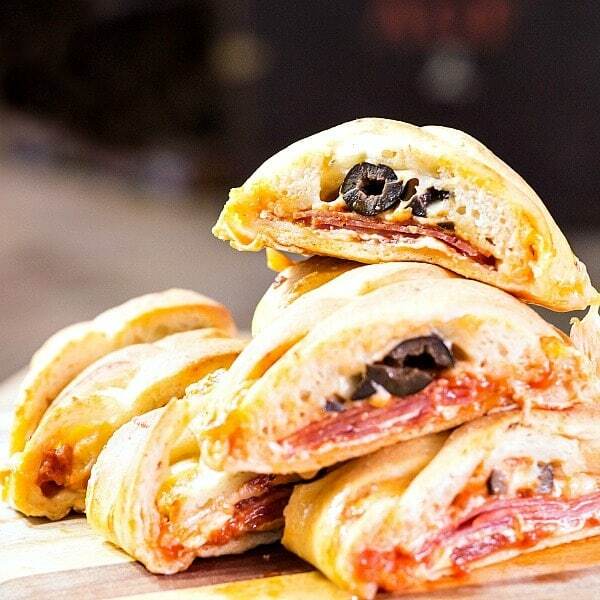 Here’s another decadent take on Pepperoni Bread from Off the Eaten Path. Enough talk. Let’s make some pizza bread, you guys. 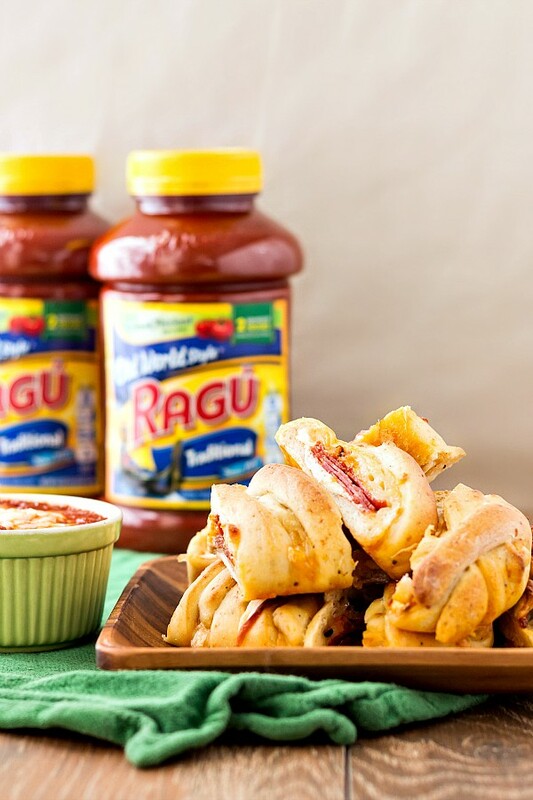 Perfect for your Super Bowl Party, use a rich and intense version of Ragu® Traditional Sauce both in your homemade pizza bread with Ragu and as a dipping sauce for it. So good, you'll make it just because, but you'll be happy to have this recipe come game day! This bread is endlessly customizable. Just use your favorite pizza toppings. As written, the recipe makes 2 12" breads. In the bowl of your stand mixer, mix the water, olive oil and salt until the salt is dissolved. Add the flour, garlic powder, Italian seasoning, black pepper and Parmesan cheese. Fit the mixer with the dough hook and mix on low speed until the dough comes together, about 2 minutes. Knead on medium speed for 10 minutes at which point you should have a very smooth and stretchy dough that completely clears the sides and bottom of the bowl. Add a tablespoon or two of olive oil to a zip top bag. For the dough into a smooth ball, place in the bag, making sure it gets completely coated with the oil. Refrigerate for 12 hours or up to 24 hours. Set a moistened coffee filter inside a deep glass or wide-mouth jar. Fold the edges of the filter back over the rim of the glass/jar all the way around, making a cuff to hold the filter in place. Carefully pour in the first amount of marinara. You may have to use 2 filters and split the amount of sauce between the two. Allow the sauce to drain for about 15 minutes. Discard any liquid that collects in the bottom of the glass. Assemble all your ingredients so they are easy to reach. Take the dough out of the fridge and cut it in half. Each of my halves weighed 11.2 oz, but nothing awful will happen if you just eyeball it. Cover the second half as you work with the first. Roll the dough out into about a 10" x 12" rectangle. I find it easiest to roll specific shapes (either round or square-ish) using a tapered pin. With a pizza cutter or a sharp knife, slice into each of the long sides of the dough by about 2 1/2", making the slices about 3/4" wide. You'll have a strip of uncut dough running down the center of your rectangle. Now "braid" your loaf by pulling the first of your dough strips from one side of your rectangle up and over the filling and to the other side. Angle the strip down toward the unfinished end. Now take first strip on the other side and pull it up and over the filling, also angled down. Repeat all along the length of your rectangle, working from side to side and angling the strips toward the unfinished end. This way, each "loose" end will get covered by a dough strip that comes after, keeping your loaf nice and neat. But even if the loaf isn't picture perfect, don't sweat it. It will still be delicious! Bake at 350F for 30-35 minutes or until a lovely golden brown. Let cool for 15 minutes before slicing. Serve warm with the dipping sauce, below. Drain the second amount of marinara just as you did the first time. Place in a microwave-safe bowl and heat until hot, about a minute or so on high power, depending on your microwave. Sprinkle on some grated cheese and microwave for another 20 seconds or so to melt the cheese. Dip with Abandon. Enjoy! * Don't use too much sauce in one layer or your layers will tend to slide. That's why I interspersed other ingredients with thin layers of sauce. Since this bread is an open braid, there is bound to be some cheese and maybe some sauce that leaks out. That can be your treat. The bread will be fantastic even without that little bit of cheese, I promise. Prep Time does not include inactive time while the dough is rising in the fridge. 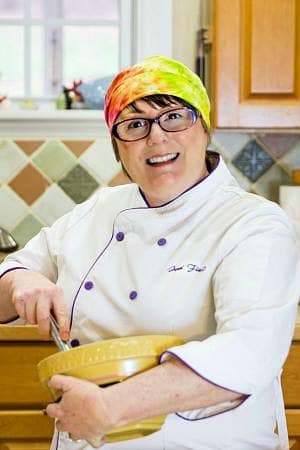 The recipe makes 2 loaves, and nutritional information is based on 1/8 of one loaf. NOTE: You do not have to make your own pizza crust. Start with a store bought ball of dough and go from there, especially if you're short on time. 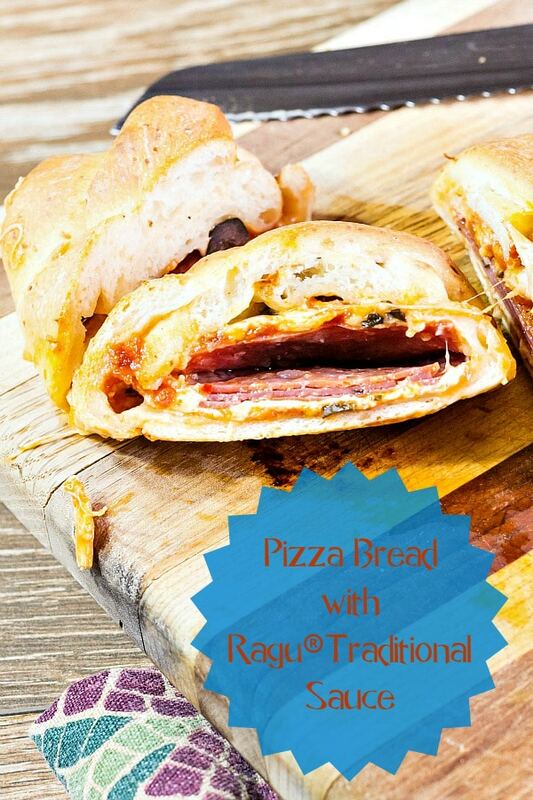 I think you’re really going to like the homemade pizza bread with Ragu ®. And I know your guests will gobble them up. Add pre-cooked meatballs (store-bought or your favorite recipe) to a jar of Ragu® Trditional. Keep at a low simmer for about 30 minutes. Serve warm with toothpicks and a sprinkle of Parmesan Cheese. Cut a baguette into thin diagonal slices and broil on both sides until golden. Drizzle with a little olive oil, a schmear of concentrated Ragu® Traditional and a bit of your favorite grated Italian cheese. Broil for a few more seconds to melt the cheese and serve warm. Purchase or make fried or baked breaded mozzarella sticks or cubes and serve with concentrated Ragu® Traditional for dipping. For more recipe ideas, visit the Ragu® Recipe page. Thank you so much for watching and reading. Enjoy the game, and enjoy the homemade pizza bread.